There’s nothing new about utilizing finite element analysis to evaluate automotive component designs for structural, thermal and fatigue strengths. 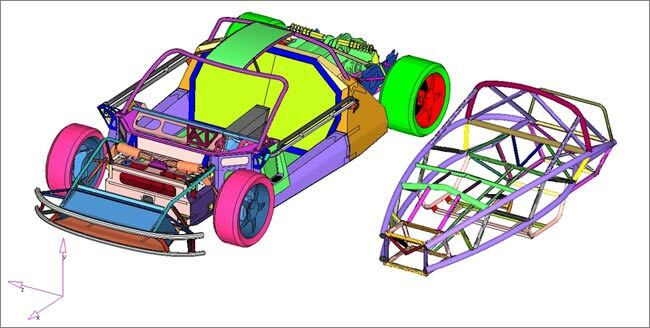 However, with modern solver capabilities, taking a deeper dive into vehicular development using finite element analysis is possible. Today, software capabilities are not simply restricted to calculating stress and deformation characteristics of the component, but can be utilized to uncover wealth of information. Let’s look at some of the most deeply automotive focused applications of finite element analysis, which catapult towards comprehensive vehicle development. While the use of finite element analysis is more focused towards structural analysis of gears employed in automobiles for power transmission, its use can be further elevated to understand the design parameters more effectively. Modern FEA solvers are equipped with the ability to comprehensively evaluate gear designs and identify appropriate gear ratios. It is possible to simulate backlash, friction, contact force and rattling effects to better understand and optimize gear designs for gearbox and differential applications. As a vital element in transmitting engine power, maintaining valve opening and closing timings and running auxiliary systems relying on engine power, the belts and chain system is of a crucial interest when it comes to engine performance. Using finite element analysis, belts and chains can be evaluated to study tension, chain dynamics, preload vibrations and drive ratios. These studies can provide assistance in application of additional tensioner or modify pulley design to accommodate tension and slackness. There’s huge application of bearings in vehicles, and its failure directly impacts the performance and engine efficiency. With finite element analysis, useful service life of the bearing can be evaluated using fatigue analysis based on S-N curves. Fatigue life estimation also becomes useful in identifying crack initiation and possible growth in shafts utilized as axles, crankshafts and propeller shafts. Predicting the failure right in the early development phase will help in improving the design against deformation and increase useful life period. The complex linking mechanisms used in steering systems are subjected to cyclic loading as well as vibrations resulting from the road surface. While excessive vibrations put the system into trouble, it also adds discomfort to the driver. Utilizing finite element method to produce a computer model, replicating real loading conditions can help in obtaining useful insights on deformation and fatigue effects. Modal analysis allows engineers to optimize the steering system against vibrations. The use of finite element analysis can also be extended to study cornering force acting on the tires. The highly non-linear behavior of the tire can be easily captured using nonlinear elements and the stress-strain relationship can be obtained. Rolling resistance and frictional effects can also be studied to optimize the tread pattern and assist in improving fuel economy of the vehicle.